Sri City, September 22, 2017:- In a colourful function held on Thursday evening at Hotel Vivanta Taj, Bengaluru, Sri City Foundation received the prestigious ‘National Award for Excellence in CSR’. Mr. Ramesh Subramaniam, President, Sri City Foundation, received a citation and the trophy from Mr. Alistair Schofield, Director, MyBrain International Limited. “This prestigious national award is yet another testimonial to our aspirations and continuing commitment to give back to the society,” he added. The National CSR Leadership Congress & Awards, jointly endorsed by the Asian Confederation of Businesses and World Federation of CSR, selected Sri City Foundation in recognition of its CSR and sustainability agenda benefitting the society and the environment. 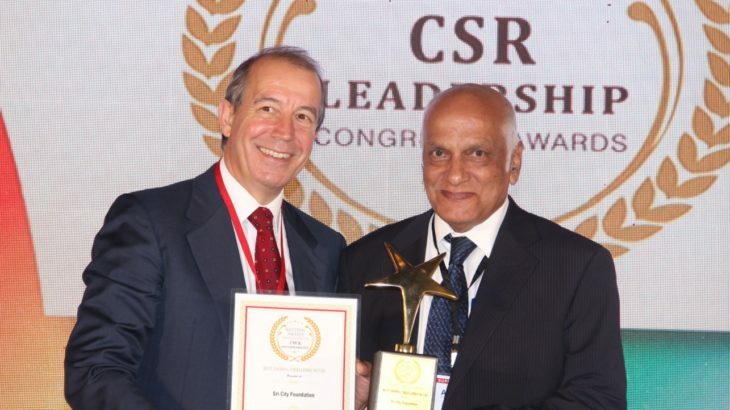 National CSR Leadership Congress & Award is one of the prestigious recognitions that honours the outstanding and innovative CSR, Sustainability and Social enterprise projects and recognises leadership in CSR. The platform recognises individuals, organisations, corporates and projects that have made phenomenal impact to the society.